Our latest bottling, was released on 26th February 2011....... and was sold out by 9th March 2011! The tenth edition of our annual "Single Cask Bottlings" is a lovely Pedro Ximinez cask from GlenDronach in the Eastern Highlands. Cask Number 1038 was distilled at GlenDronach on Wednesday 9th January 1985. 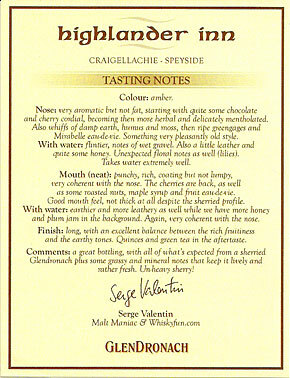 It was selected from several cask samples at a nosing and tasting with Duncan, Tatsuya and Rachel. It is an Official Distillery Bottling and we are very grateful for the help and co-operation given to us by all the folks at GlenDronach Distillery Company Ltd, specifically Alistair Walker, Billy Walker and Jim Love. 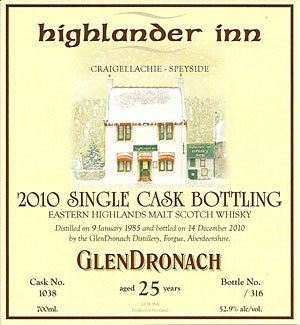 It was bottled on Tuesday 14th December 2010 at the natural cask strength of 52.9% alc/vol. A winter distillation and a winter bottling - obviously our label had to reflect this!! I can't guartantee that January 1985 was wintry, but certainly 14th December 2010 was! 316 bottles were produced (700ml). Maggie Riegler of the Greenhall Gallery, here in Craigellachie, was again commissioned to paint a picture specifically for the front label which reflects the wintry conditions that we had at the time. has agreed to give us his comments for the back label. Living in the Alsace Region of France, Serge is one of the most prolific whisky aficionados on the internet. Since 2002 he has been a member of the Malt Maniacs and is partly responsible for updating the monstrous Malt Monitor - the cross reference for all whiskies ever tasted by all maniacs - as well as organizing the distribution of samples for the annual Malt Maniacs Awards. 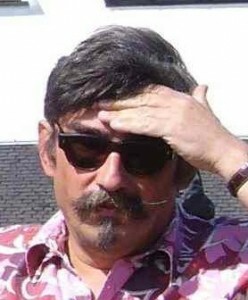 Serge has published all tasting notes and scores for the whiskies sampled by him on his website WhiskyFun.com where Nick Morgan has also intermingled concert reviews. Again, each label has been painstakingly applied to each bottle individually and then hamd numbered by Duncan Elphick ~ so it really is a personal bottling with none of this automatic labeling & numbering! It was available to purchase by the bottle (700ml) at £125.00 but is still available by the nip in our bar (25ml) at £13.50.